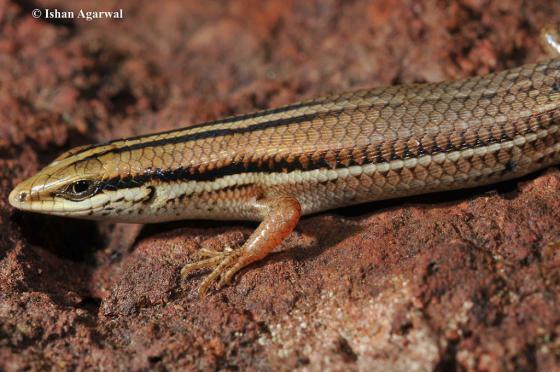 Can you confirm these amateur observations of Eutropis bibronii? Type locality: “South Africa” (in error), collector and date unknown; Amarasinghe et al. 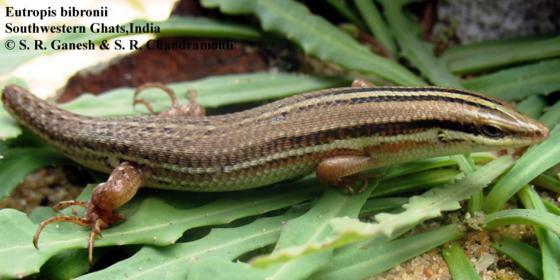 (2016) suggest to correct the type locality to Madras, South India based on the type locality of the syntypes for Euprepis trilineatus. Types Syntypes: MNHN-RA 2940 and MNHN-RA 7076, no locality or collector. Diagnosis Diagnosis. 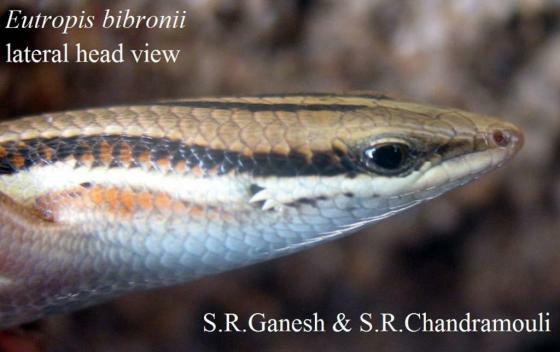 The following combination of characters distinguishes Eutropis bibronii from all other Indian congeners: two dark paravertebral stripes separated by a pale median stripe on the back, undivided lower-eyelid disc, single postnasal, 28–30 midbody scale rows, 37–41 paravertebral scale rows, 46–52 ventrals, 5 keels on dorsal scales, 15–19 subdigital lamellae under fourth toe, two long pre-auricular lobules on each anterior tympanum, prefrontals slightly or broadly separated, two pairs of large nuchals (rarely three) [from Amarasinghe et al. 2016]. Comment Synonymy: following Boulenger 1887: 173 and AMARASINGHE et al. 2016.